Earthquakes, volcanic eruptions, volcanic island flank failures and underwater slides have generated numerous destructive tsunamis in the Caribbean region. 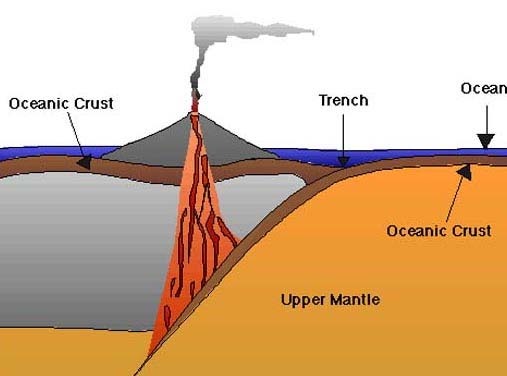 Convergent, compressional and collisional tectonic activity caused primarily from the eastward movement of the Caribbean Plate in relation to the North American and South American Plates, is responsible for zones of subduction in the region, the formation of island arcs and the evolution of particular volcanic centers on the overlying plate. The inter-plate tectonic interaction and deformation along these marginal boundaries result in moderate seismic and volcanic events that can generate tsunamis by a number of different mechanisms. The active geo-dynamic processes have created the Lesser Antilles, an arc of small islands with volcanoes characterized by both effusive and explosive activity. Eruption mechanisms of these Caribbean volcanoes are complex and often anomalous. Collapses of lava domes often precede major eruptions, which may vary in intensity from Strombolian to Plinian. Locally catastrophic, short-period tsunami-like waves can be generated directly by lateral, direct or channelized volcanic blast episodes, or in combination with collateral air pressure perturbations, nuess ardentes, pyroclastic flows, lahars, or cascading debris avalanches. Submarine volcanic caldera collapses can also generate local destructive tsunami waves. Volcanoes in the Eastern Caribbean Region have unstable flanks. Destructive local tsunamis may be generated from aerial and submarine volcanic edifice mass edifice flank failures, which may be triggered by volcanic episodes, lava dome collapses, or simply by gravitational instabilities. The present report evaluates volcanic mechanisms, resulting flank failure processes and their potential for tsunami generation. More specifically, the report evaluates recent volcanic eruption mechanisms of the Soufriere Hills volcano on Montserrat, of Mt. 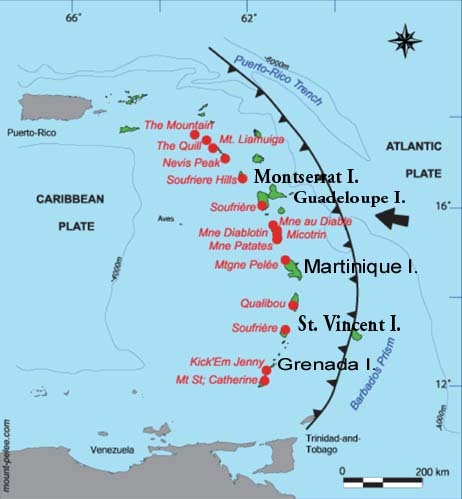 Pelée on Martinique, of Soufriere on St. Vincent and of the Kick'em Jenny underwater volcano near Grenada and provides an overall risk assessment of tsunami generation from volcanic sources in the Caribbean region. Tectonic deformation and active geo-dynamic processes in the Caribbean region have produced distinct seismic and volcanic activity sources capable of generating destructive tsunamis. The historic record documents numerous events in this region for the last 400 years (Lander et al. 2002, 2003; ETDB/ATL: Expert Tsunami Database for the Atlantic, 2002). The list includes tsunamis from distant sources, such as that generated by the 1755 Lisbon earthquake. Eighty-eight tsunamis from local and distant sources have been reported for the 1489 to 1998 time period. Several of these were generated by volcanic eruptions and by collateral volcanic flank failures, debris avalanches, and landslides. A rough evaluation of the cumulative frequency of tsunamis was done specifically for the Barbados and Antigua (Zahibo and Pelinovsky, 2001). Additionally, recently found submarine debris avalanches on the sea floor around many islands in the Lesser Antilles suggest that large scale landslides and volcanic island flank collapses must have generated tsunamis in the distant past (Deplus et a 2001). Also, extremely large paleotsunami activity has been postulated for the Southern region of the Leeward Lesser Antilles, consisting of the islands of Aruba, Curacao and Bonaire (Scheffers, 2002) within the tectonically active Caribbean - South American plate boundary zone and the West Indies Island Arc. However, it remains to be determined whether the extremely large boulders and rocks found on these islands, some at high elevations, are indeed deposits from paleotsunamis - as speculated ­ and what the source regions may have been. There have been several numerical modeling studies of tsunamis in the Caribbean and tsunami travel time charts for the region have been prepared (Weissert, 1990). Additionally, historical tsunamis of seismic origin have been extensively documented and numerically simulated. Some of the best-studied historic events are the 1867 Virgin Island earthquake and tsunami (Devill, 1867; Reid and Taber, 1920. Zahibo et al 2003) and the 1918 tsunami in Puerto Rico (Mercado and McCann, 1998). The heights of tsunami waves from distant sources ­ such as those generated by the 1755 Lisbon earthquake or from a postulated, massive landslide on La Palma, Canary Islands, have been estimated with numerical models (Mader, 2001a, 2001b). The threat of mega tsunami generation from the same postulated massive slope failure of the Cumbre Vieja stratovolcano on La Palma and the far field effects in the Eastern Atlantic from such an unlikely event, have been assessed (Pararas-Carayannis, 2002). The flank instabilities of the island volcanoes in the Lesser Antilles are well known and adequately documented (Le Friant, 2001). In the last decade, tsunamis generated by landslides and flank failures that followed eruptions of the Soufriere Hills volcano on Montserrat Island and an increased level of activity of the submarine volcano known as Kick'em Jenny, north of Grenada, have raised concerns about the generation of destructive tsunamis from these and other volcanic sources in the region. Because of such concerns, water waves generated by potential debris avalanches and landslides on Montserrat were numerically simulated and evaluated (Heinrich et al., 1998, 1999a,b, 2001; Mangeney et al., 2000; Zahibo and Pelinovsky, 2001). Similarly, a gravitational dome collapse of the Soufriere Hills volcano on Montserrat Island and the resulting pyroclastic flows that could generate tsunamis were modeled (Hooper and Mattioli, 2001). Finally, numerical simulations of Kick'em Jenny's explosions were completed (Ginsler et al 2003, 2004). Scope of Present Study: The present evaluation extends on these investigations by reviewing primarily the eruption mechanisms of some of the more active volcanoes of the Eastern Caribbean Region and the factors that contribute to their instabilities, massive flank failures, and tsunami generation. Active tectonics, subduction, block movements inferred from tectonic studies, seismological and geodetic data, and the evolution, geochemistry and eruption mechanisms of particular volcanic centers are reviewed for the purpose of evaluating volcanic explosivity factors ­ in general - and potential collateral mass edifice failures ­ in particular - that may result in tsunami generation. Specifically reviewed are historical eruptions and flank collapse events of Soufriere Hills on Montserrat, of Mt. Pelée on Martinique, of Soufriere on St. Vincent, and of Kick'em Jenny near Grenada. Based on an analysis of the eruptive and mass failure mechanisms of these volcanoes, the risk of tsunami generation from such sources is evaluated for the entire Eastern Caribbean Region. Finally, through analogies and comparisons of differences and similarities of volcanic compositions and failure mechanisms, conclusions are drawn about the tsunamigenic efficiency of such processes, and the near and far field effects of tsunami waves generated by historical events or that can be expected in the future from postulated massive edifice flank collapses of other volcanoes in the Caribbean region and around the world. Understanding tsunami generation mechanisms from volcanic sources in the Caribbean requires a brief review of the tectonic setting of the region and of the development of volcanic centers. The present review focuses on the presently volcanically active Eastern region, where most of the recent tsunamis of volcanic origin have occurred. The Caribbean plate forms part of a region of great geologic and geographic diversities. It extends from southern N. America to northern S. America. It includes Central America, thousands of islands, and the oceanic areas in between. Geologically, the Caribbean has undergone many changes during its complex evolution (AAPG, 2003). There have been plate migrations, hotspot and mantle plume activity, island arc development and disappearance, subduction reversals, opening of young oceanic basins, major plate migration, and major block rotations. 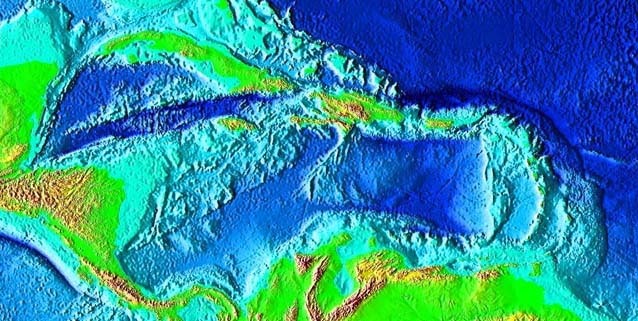 The Caribbean Plate is largely oceanic, although it carries large continental fragments in its western region. 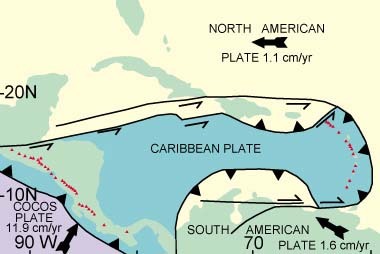 Currently, the Caribbean plate is moving eastward in relation to the North and South American Plates at a rate of approximately 20 millimeters per year. The plate movement is responsible for the zones of subduction along the active boundaries and the formation of the West Indies Volcanic Island Arc on the overlying plate in the eastern region. These interactions lead to a moderate level of inter-plate seismicity and interplate and intraplate volcanic activity. Presently, the Caribbean region is characterized by convergent, compressional and collisional tectonic activity, which results in frequent occurrences of earthquakes and volcanic eruptions. Often, localized landslides and volcanic island mass edifice failures are collaterally triggered. Most of these events occur near or along the geotectonically active plate boundaries and can generate local tsunamis with complex mechanisms, which represent the characteristics of each particular source. Seismic events in the Eastern Caribbean are principally associated with a subduction zone along a north-south line just east of the main island arc where the North American Plate dips from east to west beneath the Caribbean Plate. The evaluation of the active seismic centers and the tsunamigenic efficiency of subduction earthquakes in the Caribbean region will be presented in a separate report. The Evolution of Volcanic Centers in the Eastern Caribbean Region: Volcanic centers in the region is the by-product of active tectonic activity. Subduction is responsible for the evolution of the Lesser Antilles, an arc of small islands with active volcanoes characterized by both effusive and explosive activity (Martin-Kaye1969). Specifically, the down-dip compression on the North American plate caused by tectonic movement has created the tensional volcanic back-arc, which is characterized by spreading and shallower seismic activity. As the fore-arc is driven by the mantle drag toward a trench ­ the zone of subduction - the resulting compression is balanced with the slab pull. This flow in the mantle causes the back-arc spreading (Seno and Yamanaka, 1998). Arc stresses and back-arc spreading result in increased volcanic activity in the region and in a greater potential for tsunami generation from subsequent volcanic mass edifice failures, and other mechanisms, which will be discussed and evaluated further in subsequent sections. 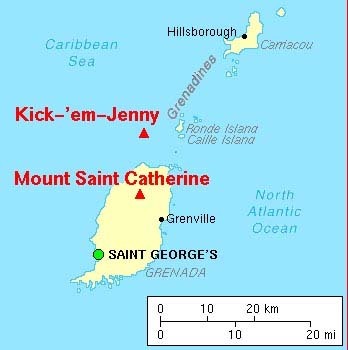 In recent times, Soufriere Hills on Montserrat, Kick'em Jenny near Grenada, Soufriere of St. Vincent, and Mt. Pelée on Martinique, are volcanoes in the Lesser Antilles region that have generated local tsunamis by renewed volcanic activity and associated flank failures and landslides (Lander et al 2002). Given the degree of violent volcanic activity and the flank instabilities of stratovolcanoes in the region, it is believed that the occurrences of tsunami waves have been under-reported in historical records, probably because the effects of such sea level disturbances were either localized or were overshadowed by greater catastrophes caused by violent volcanic eruptions The following is a brief overview of some of the reported historical tsunami events. The recent historic record documents several tsunamis at Montserrat Island. Earthquakes in the area generated some of these, while others were generated by pyroclastic flows of the Soufriere Hills stratovolcano, by debris avalanches, and by major flank failures and landslides. Also, the coastal geomorphology of the eastern part of Montserrat near the Chance Peak of the Soufriere Hills volcano indicates that massive landslides must generated local tsunamis in the distant past. According to the more recent historic record, an earthquake in the region on September 13, 1824, resulted in a remarkable rise and fall of sea level at Plymouth. Another major earthquake near Antigua, reportedly triggered landslides into the sea in Antigua, Montserrat and Nevis Islands. However, most of the noteworthy tsunamis were generated recently as a result of renewed activity of the Soufriere Hills volcano. On December 26, 1997, following a major eruption of Soufriere Hills a landslide - assisted by pyroclastic flows - reached the sea along the southwestern coast of the island and generated significant tsunami waves. (Heinrich et al., 1998, 1999a,b, 2001). Maximum runup of the waves, about ten kilometers away from the source region, was about 3m, with inland inundation of about 80 meters. Similar debris avalanches and pyroclastic flows associated with a 1999 eruption of Soufriere Hills reached the sea and generated another local tsunami. The height of the waves in the immediate area ranged from1­2m but attenuated rapidly. By the time they reached the islands of Guadeloupe and Antigua the maximum runup heights were only about 50 cm. The most recent tsunami occurred on July 12, 2003, following a major collapse of a lava dome (Pelinovsky et al 2004). A pyroclastic flow reached the sea and generated a tsunami, which was reported to be about 4 meters on Montserrat and about 0.5-1 m at Guadeloupe. Fig. 8. Travel time chart of the tsunami generated by the 1999 debris avalanche at Montserrat Island. Mt Pelée on Martinique is another active stratovolcano with unstable flanks composed primarily of pyroclastic rocks. As such, it must have generated numerous tsunamis in the distant geologic past. The first reported violent eruption of Mt Pelée occurred in 1792. The record does not indicate whether the eruptions caused flank failures on the island or generated tsunamis. Such events could have occurred but not reported. Even the recent historic record is unclear. 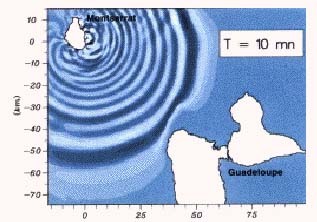 For example, there are reports of observed sea level agitations on Martinique in 1767, but it is not known whether these were tsunami waves generated by a distant earthquake or an island flank failure. On 30 November 1823 an earthquake in the area generated a tsunami, which caused damage to St. Pierre Harbor. In 1824, another earthquake near St. Pierre was probably responsible for a very "high tide" that reportedly grounded several ships in the harbor. In the spring of 1902, Mt Pelée began erupting again. According to historic records, as the summit eruptions intensified, the water of the Etang Sec crater lake heated to near boiling point. On May 5, the crater rim broke, and extremely hot water cascaded down River Blanche. The hot water, mixed with loose pyroclastic debris and mud, formed a massive 35-meter high lahar that reached a speed of about 100 kilometers per hour. The hot volcanic mudflow buried everything in its path. Near the mouth of River Blanche, north of St. Pierre, it hit a rum distillery and killed 23 workers. The lahar continued into the sea, where it generated 4-5 meter tsunami waves, which flooded the low-lying areas along the waterfront of St. Pierre. Subsequently, on May 8, 1902, a catastrophic nuée ardente cascaded for about 6 km down-slope from the central crater of the volcano, at a velocity of more than 140 Km per hour, destroying completely St. Pierre, and killing 29,000 of its inhabitants. According to the historic record there were only two survivors ­ one in a prison dungeon. There is not much information on the tsunami that the nuée ardente must have generated, as the immensity of St. Pierre's destruction overshadowed everything else. There is not much information about tsunamis generated from eruptions or flank failures of the Soufriere volcano on St. Vincent Island, although several must have occurred. The historic record shows that the volcano erupted violently in1718, 1812, 1902, 1971-1972 and in 1979. The 1902 eruption was the most catastrophic and killed 1,600 people. The record shows that, on May 7, 1902, a day before the most violent eruption of Mt Pelée on Martinique, tsunami like disturbances of up to 1 meter were reported for the harbors of Grenada, Barbados and Saint Lucia. Although the origin of these waves is not known with certainty, the most likely source could have been pyroclastic flows reaching the sea from the violent eruption of Soufriere volcano on St. Vincent. Alternatively, the sea level disturbances could have been generated by an unreported flank failure of Mt Pelée, which was also erupting at that time. The historic record documents that on May 7, 1902 the submarine communication cables from Martinique to the outside world were cut. Kick'em Jenny is an active and growing submarine volcano about 8 km off the North side of the island of Grenada, which erupted frequently during the 20th Century (Smithsonian Institution, 1999). There have been several local tsunamis generated by these eruptions. The volcano's first recorded eruption reportedly occurred in 1939, but undoubtedly there were many unreported occurrences before that date. Since 1939 there have been at least ten more eruptions. The better known are those that occurred in 1943, 1953, 1965, 1966, 1972 and 1974. The 1974 eruption was major. The last known major eruption occurred in 1990. The 1939 and 1974 eruptions ejected columns above the sea surface. At the peak of the July 24, 1939 eruption - which lasted more than 24 hours - a cloud rose 275 meters above the sea surface (Tilling, 1985; Seismic Research Unit Website, Univ. of West Indies, 2001). The event was witnessed by a large number of people in northern Grenada. Kick'em Jenny's 1939 eruption also generated a series of tsunami-like waves, which had amplitudes of about 2 meters in northern Grenada and the southern Grenadines. The waves probably reached the west coast of the Barbados, but were not noticed as their heights had attenuated significantly. Based on what appear to be debris avalanches or toes of large scale landslides on the ocean floor, it has been postulated that mega-tsunamis were generated in the distant geologic past by massive volcanic flank failures in the Canary, Cape Verde and Hawaiian islands, as well as elsewhere in the Atlantic, Pacific and Indian oceans. 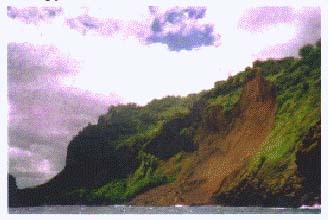 Pararas-Carayannis (1992, 2002, 2003) evaluated mega-tsunami generation from prehistoric and postulated massive landslides and flank failures of oceanic basalt shield stratovolcanoes such as Kilauea, Mauna Loa, Cumbre Vieja, Cumbre Nueva, Taburiente and Piton De La Fournaise, and from the explosions/collapses of continental stratovolcanoes linked to catastrophic phreatomagmatic episodes of Plinian and Ultra-Plinian intensities, such as those that occurred at Krakatau and Santorin. Some volcanic source mechanisms of tsunami generation were realistically modeled in estimating the near and far field wave characteristics (Mader, 2001; Le Friant, 2001; Gisler 2004). However, there has not been adequate evaluation of tsunami generation from eruptions and flank failures of unstable basalt/andesitic Caribbean volcanoes, which are neither truly oceanic nor continental and have different geochemistry and eruption styles and processes. Tsunami Generation Mechanisms of Shield Volcanoes ­ Oceanic, basalt shield volcanoes have different styles of eruption, thus their mechanisms of flank failures and of tsunami generation differ from those of volcanoes along continental boundaries. Most of the basaltic stratovolcanoes have Hawaiian styles of eruptions, which usually involve less explosivity, and passive lava flows because of lower silica, gas content and ejecta viscosity. Occasional sudden gas releases may produce explosive lava fountains and unstable pyroclastic deposits. Small scale hydromagmatic explosions can also occur near the coast. Examples would be those that formed the Diamond Head and Coco Head craters on the island of Oahu, in Hawaii. However, most of the eruptions of shield volcanoes are usually confined near summit calderas or slong flank craters and vents. Resulting slides from unconsolidated pyroclastics usually involve relatively small volumes of material, which rarely reach the sea to generate waves of any consequence. However, destructive tsunamis can be generated from massive volcanic edifice failures of larger blocks which may be triggered by large scale magmatic chamber collapses, erosion, gaseous pressure, phreatomagmatic and forced dike injection, or by isostatic and gravity induced kinematic changes (Pararas-Carayannis 2002). Any of these processes can trigger large volcanic mass failures of shield volcanoes, alone or in combination with other mechanisms. Tsunami Generation Mechanisms of Caribbean Volcanoes - There is plethora of geologic evidence indicating that volcanoes in the Caribbean region have generated tsunamis, recently and within the last 100,000 years, by a variety of mechanisms. Destructive tsunami waves were generated by violent sub-aerial and submarine eruptions and accompanying earthquakes, by caldera and submarine flank collapses, by subsidence, by atmospheric pressure waves, by lahars, nuées ardentes, pyroclastic flows, or debris avalanches. Also, tsunamis must have been generated from gravitational mass edifice failures due to the characteristic flank instabilities of the volcanoes in this region - even in the absence of obvious triggering events. For example, earth tides could trigger such failures. Evaluation of flank instabilities of Caribbean stratovolcanoes and their potential for tsunami generation requires a closer examination of the styles, intensity and geometry of eruption mechanisms, of precursor events, of the time history of volcanic episodes, of the geochemistry and composition of the lava and ejecta, as well as an assessment of tectonic processes in the region which result in volcanic arc stresses, back-arc spreading and an increased level of volcanic activity. Small scale flank collapses which result in tsunami generation are a standard phase in the evolution cycles of Caribbean volcanoes (Young 2004.). The following is a review of different factors for Caribbean volcanoes that contribute tor eruptions episodes, which may range in style and intensity from Strombolian to Vulcanian/Plinian, but are not as catastrophic as the Plinian and Ultra-Plinian episodes of the Krakatoan/Santorin variety. Specifically reviewed in the next section are precursor events and eruption processes of some of the previously mentioned active volcanoes of the Lesser Antilles ­ processes that result in moderate flank failures and the generation of tsunamis or tsunami-like waves. Although the present analysis focuses on mechanisms of flank failures of active Caribbean stratovolcanoes, it should be pointed out that the processes and mechanisms that are described are similar to those occurring at many other volcanoes around the world. Furthermore, it should be pointed out that, in contrast to tsunami generation from seismic sources, which cannot be predicted, the generation of tsunamis from volcanic sources can be forecasted with proper monitoring of precursor events, of volcanic activity and of flank instabilities. The following sections provide an analysis of factors that contribute directly to eruptions, flank instabilities and failures of Caribbean volcanoes and indirectly to the generation of destructive sea waves. Tsunamis can be generated by volcanic caldera and lava dome collapses, by vertical, lateral or channelized explosive activity and by the associated atmospheric pressure perturbations, pyroclastic flows, lahars, debris avalanches or massive volcanic edifice failures. Contributing tectonic factors include island arc volcanism that overlies a subduction zone and which can result in the most catastrophic types of eruptions. Many additional specific factors determine the eruption style, higher explosivity, the generation of pyroclastic flows, the structural flank instabilities, the slope failures and the debris avalanches that characterize the mainly andesitic Caribbean volcanoes. The following is a description of these factors for the most active volcanoes in the Caribbean region. However the same factors apply to all basaltic/andesitic volcanoes around the world that border tectonic boundaries. Whether a volcano will have effusive eruptive activity or explosive type of bursts will depend primarily on geochemical factors. The build up of pressure of volatile gases within the magmatic chambers determines a volcano's eruption style, explosivity, flank instability and potential for subsequent tsunami generation. Variations in the chemical composition of volcanic eruptive effluents result from differences in the mineralogy and the bulk composition of mantle material, differences in depth at which melting occurs, differences in percentages of melting at the source, and alterations in composition as the magma rises to the surface (Wright and Helz, 1987). The chemical composition of molten rocks in the magmatic chambers of a volcano and the different abundances of elements, particularly silica, determine the viscosity of effluents that can rise to the surface. Magmas, which are low in silica and rich in iron and magnesium, like the basalts of Hawaiian types of volcanoes, are very fluid. Basalt contains anywhere from 45% to 54% silica, and generally is rich in iron and magnesium. Dissolved gases escape prior to an eruption, thus resulting in a subsequent effusive eruptive activity associated with relatively gentle lava flows. Because of the low viscosity, lava flows travel great distances from the eruptive vents, and produce broad, shield-shaped volcanoes. Kilauea, in Hawaii, is an example of such a volcano. By contrast, the chambers of stratovolcanoes along continental margins contain magma which is composed primarily of andesite or dacite, that are relatively high in silica and low or moderate in iron and magnesium. Andesite may contain anywhere from 54 to 62 percent silica. Thus magma material tends to be very viscous. Gases are trapped and cannot escape until the magma enters the volcanic conduits leading to the surface. The reduction in pressure, allows the gas bubbles in the magma material to nucleate and expand. When the outward pressure exerted by the gas bubbles exceeds the strength of the lava material above it, the volcano erupts violently. Because of the high pressure of the expanding volatiles, the lava is fragmented to produce volcanic ash and pyroclastics that are ejected out of the volcanic vent at high velocity. Most of the ash travels far but pyroclastics accumulate near the vent, thus producing a steep-sided stratovolcano with very unstable flanks. An example of such a volcano is Mount St. Helens in the State of Washington. The volcanoes of the Lesser Antilles in the Caribbean region are mainly andesitic stratovolcanoes, characterized by both effusive and explosive activity (Brown et al. 1977). However, even effusive activity may culminate into explosive activity at later stages of an eruption, as the more viscous magma material reaches the surface. Explosive eruptions of Caribbean volcanoes may last for hours and will result in greater volcanic cone instabilities. Intensities and stypes of explosive episodes may range from Strombolian, Vulcanian to even Vulcanian/Plinian. During such eruptions, destructive sea waves may be generated directly by pyroclastic flows, lahars and nuées ardentes reaching the sea, and by atmospheric pressure waves of blast events. Debris avalanches and massive volcanic flank failures can also generate destructive waves during an eruption or subsequently. As a result of the geochemistry and the higher viscosity of the mainly andesitic magma, Caribbean volcanic activity often results in the formation and growth of lava domes near a volcano's summit or along its flanks (Voight 2000). Rapid lava dome growth, after a quiet volcanic activity period, is indicative that pressure is building up within a volcano. Subsequent collapses of lava domes often trigger a flurry of volcanic eruptions which will vary in intensity and may be associated with catastrophic pyroclastic flows, lahars, debris avalanches and large scale flank failures ­ which can generate directly destructive local tsunamis. In fact the collapse of a growing lava dome has the potential of generating directly destructive pyroclastic flows, lahars or debris avalanches, which, upon reaching the sea, can generate destructive local tsunamis. Indirectly, such volcanic processes may weaken the flanks of the volcano, thus flank failures may be retrogressive and time-dependent. Thus, lava dome growth, chemical and geometric factors, and the mechanisms of weakening that result in eventual collapses, are important factors in assessing a volcano's overall instability and in forecasting a major eruption or even the generation of a tsunami. As already indicated, the sudden releases of gases are responsible for a volcano's explosivity and flank instability and thus trigger flank failures which can generate destructive tsunami waves. Additionally, the direct explosive outflux of volcanic volatiles can create sudden atmospheric pressure disturbances which, coupled with the sea surface, can also generate destructive waves. Significant atmospheric pressure perturbations that are propagated by buoyancy forces during violent volcanic eruptions can have periods greater than 270 seconds (Beer, 1974). The periods of the atmospheric waves is dependent on the volumes of volatiles and the duration of volcanic bursts. For example, spasmodic volcanic bursts of Caribbean volcanoes during a violent eruption may produce extremely large movements of air parcels similar to those produced by the 1980 Mount St. Helens eruption (Mikumo and Bolt, 1985; Tilling 1984; Tilling, et al 1990) or to the 1992 Pinatubo eruption (Tahira et al., 1996). Eruptive phases consisting of numerous eruptive pulses may last from a few hours to days. Explosive pulses may last from a few seconds to minutes and may vary in intensity depending on the impulsivity of the degassing source (Newhall & Self, 1982). Such volcanically generated atmospheric pressure waves can generate several destructive tsunami-like waves of longer periods with heights, which will not attenuate as rapidly as those from other wave generation mechanisms. Additionally, the geometry of eruption blasts is a factor that will also determine a volcano's flank instability and its potential for massive failures, avalanches or subareal or submarine landslides and subsequent tsunami generation. Generally, volcanic blasts mechanisms can be vertical, lateral-direct or channelized. If the blasts affect directly a body of water, then more destructive local tsunamis can be expected. Vertical Blast Mechanisms - More typical for Caribbean volcanoes are the vertical type of blast mechanisms, which will deposit unconsolidated pyroclastic debris and build up cones with unstable flanks. Gravity forces may eventually lead to cone collapse or other failures, which in turn may trigger lahars, larger flank landslides or debris avalanches, usually on the steep-sided stratovolcanoes. As previously discussed, strong blasts can also generate atmospheric pressure perturbations which, depending on duration and intensity, may couple with the sea surface to form additional destructive waves of varying periods. Lateral and channelized blasting effects can be far reaching if they occur near a body of water. A large lateral blast from an erupting Caribbean island volcano could be extremely destructive and could also generate much more destructive local tsunami waves. The May 8, 1902, explosion of Mt. Pelée that destroyed the city of St. Pierre on the island of Martinique was such a lateral blast. Lahars and nuées ardentes generated destructive local tsunamis. 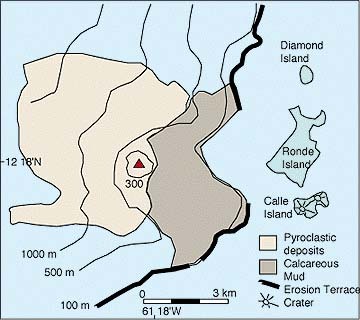 The distribution of pyroclastic deposits on the western flank of the underwater volcano Kick'em Jenny indicates that such lateral blasting occurred there in the past. There is also a major escarpment that suggests other types of massive slope failures. In view of the above-described complex factors, proper numerical modeling of tsunami generation from volcanic sources requires consideration of explosion dynamics, of the time history of blast events, of the geometry of sudden explosions, and of water displacements caused by both movements of mass and by atmospheric pressure waves. Recent historical tsunamis generated at Montserrat, Martinique, St Vincent, and Grenada Islands in the Lesser Antilles region were briefly reviewed. Obviously, the mechanisms of tsunami generation from volcanic sources can vary significantly even within the same geotectonic region. In the following sections, the eruptive processes at work for active volcanoes such as Soufriere Hills, Mt. Pelée, Soufriere and Kick'em-Jenny will be reviewed and analyzed, as well the time history of major specific eruptions that resulted directly or indirectly in tsunami generation. The Soufriere Hills, located on the southern part of Montserrat Island, is a very active, primarily andesitic stratovolcano (Rowley1978), which is the predominant type of explosive volcano in the world. Its present elevation is 915 m. The first known historical eruption was in 1995. Since then there have been several more eruptions in the late 1990s (Hooper and Mattioli, 2001). The volcano is presently very active. All of its eruptions have been associated with earthquake swarms , lava dome collapses, steam explosions, ash falls, pyroclastic flows and debris avalanches. The volcano's flank instability and its potential for landslides and tsunami generation result from the composition of its magma which is very sticky and has a high content of dissolved water. In fact, eruptions appear to be linked with rainstorms and high earth tides. When the volcano erupts it tends to form a steeply sloped peak made of alternating layers of lava, block, and ash. Thus, the slopes of the volcano become unstable and susceptible to massive landslides and debris avalanches, some of which can reach the sea and generate local tsunamis. In fact several have occurred in the last few years. Eruptive Processes of the Soufriere Hills Volcano: To understand better the tsunamigenic potential of the Soufriere Hills volcano on Montserrat, we must review further its eruptive processes. Two types of eruptive mechanisms characterize this volcano, both of which have the potential to generate local tsunamis. In both cases, magma inside the volcano is driven up by buoyancy and gas pressure, which may vary depending on its viscosity. In one type of eruption, the volcano will explode and shoot molten rock violently into the air in the form of dense clouds of lava fragments. The larger and heavier fragments tend to fall back around the volcanic vent which may become increasingly unstable as the eruption progresses. Often, the accumulation may run down slope as ash flows, while some of the finer particles may be carried by the wind. Often, both ash and pyroclastic flows can trigger debris avalanches and larger landslides and slope failures on the volcano ( DeGraff 1988) that can generate small local tsunamis. Fig. 11. 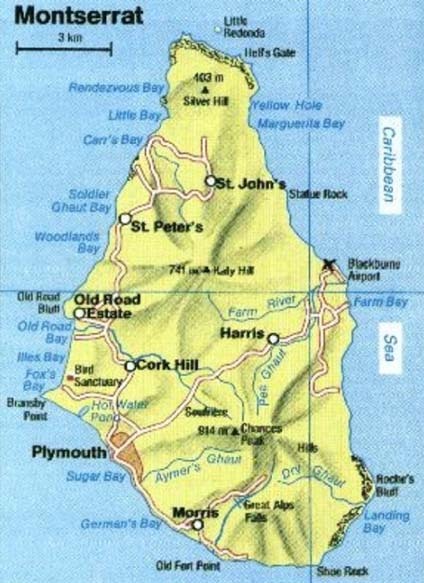 The Island of Montserrat, the Soufriere Hills volcano and the town of Plymouth. In the second type of eruption, the molten rock - which is lighter than the surrounding solid rock - breaks through the weaker stratigraphic layers and raises closer to the surface forming a lava dome. When the dome becomes too steep, or if pressure within builds up, it collapses and disintegrates, spewing lava and hot ash down the side of the volcano. Also, it may form a mushroom cloud of ash that can spread over the island. The collapse of such lava domes releases pressure and frequently causes subsequent massive eruptions that can also affect the volcano's flank stability, thus generating pyroclastic flows, debris avalanches, landslides and massive flank failures. In fact a combination of the above-described eruptive processes occurred during eruptions in the summer of 1995. Specifically, on July 18, 1995, Soufriere Hills had its first recorded eruption in historic times. It begun with a small phreatic eruption. Periods of intense seismic activity were associated with ejection of steam and ash, shortly after a new vent opened southwest of an old volcanic dome known as Castle Peak. The eruption culminated into a major event on August 21, 1995, when the volcano begun spouting molten ash, rock, and gas over the island, killing 19 and incinerating the capital city of Plymouth. A strong burst of steam carried a cloud of ash to an altitude of 7,000 feet. The eruption triggered several landslides that reached the sea, but there was no report of any unusual waves being generated. (Mangeney et al. 1998; Calder et al. 1998). The Eruption and Tsunamis of 26 December 1997 and 1999 and 2003: As already mentioned, the Soufriere Hills volcano either erupts by exploding and expeling lava or by dome collapse. Both types of eruption can be destructive as they can produce dangerous ash hurricanes and pyroclastic flows, trigger landslides and debris avalanches and thus generate tsunamis. Although the 1995 eruption and other volcanic processes that occurred subsequently did not generate a tsunami, apparently they weakened Soufriere Hills' flanks. This weakness contributed to the subsequent volcanic flank failures associated with the eruptions of 1997, 1999 and 2003 ­ which generated tsunamis. Specifically, on June 25, 1997, after two years of precursory swelling and micro earthquake activity, Soufriere Hills volcano erupted again. A damaging pyroclastic flow of ash, gas, and rock killed at least ten people and destroyed nine villages. A lava dome was subsequently observed which built up steadily in the volcano's crater for over two months. On 26 December 1997, following the collapse of this lava dome, a major eruption occurred. The eruption generated ash hurricanes, which destroyed Plymouth. Both the ash hurricanes and a landslide - possibly assisted by pyroclastic flows triggered by the dome-collapse - reached the sea, along the southwestern coast of the island and generated significant tsunami waves. (Heinrich et al., 1998, 1999a,b, 2001). The maximum runup of the waves was about 3m. about ten kilometers away from the source region, with inland penetration of about 80 meters. The volume of the landslide debris, which generated this tsunami, was estimated to be about 60 million cubic meters (Lander et al., 2003). Similar debris avalanches and pyroclastic flows associated with the1999 eruption of Soufriere Hills reached the sea and generated another local tsunami. The height of the waves in the immediate area ranged from1­2m but attenuated rapidly. By the time the waves reached the islands of Guadeloupe and Antigua their heights attenuated considerably. Maximum runup heights were only about 50 cm. The most recent tsunami was produced by the eruption of July 12, 2003 (local date) following a major collapse of a lava dome (Pelinovsky et al 2004; Young 2004). Pyroclastic flows and a debris avalanche reached the sea at the end of Tar River Valley on the east coast and generated this tsunami, which was reported to be about 4 meters at Spanish Point on Montserrat Island and about 0.5-1 m at Deshaies and near Plage de la Perle on Guadeloupe where it caused some damage to fishing boats. In support that debris avalanches and extensive landslides of andesitic volcanoes will only generate local destructive tsunamis, is supported by the April 20, 1988 massive flank failure of the northeast flank of the volcano La Fossa on the Island of Volcano in the southern Tyrrhenian Sea, in Italy. According to modeling studies - which were based on photogrammetric techniques conducted in 1981 and 1991 - the large 1988 flank failure of La Fossa involved a mass with a volume estimated to be about 200,000 cubic meters. The mass that was detached fell into the sea for about 10 seconds. A small tsunami was generated in the bay between Point Nere and Point Luccia on the island. Maximum observed runup height of the waves was about 5.5 meters at Porto di Levante and presumably even at Monterosa on Lipari Island. (Barberi, et al 1990; Lander et al. 2003). Mt. Pelée on Martinique is a very active island-arc stratovolcano with unstable flanks made mostly of pyroclastic rocks (Smith and Roobol 1990). Its summit elevation is 1397 m. It undergoes similar eruptive processes as other Caribbean volcanoes and can also generate destructive local tsunamis by pyroclastic flows, flank failures or debris avalanches. However, what makes Mt. Pelée unique has been its unusual lava dome formations, the intensity and styles of its eruptions and the unusual and violent pyroclastic flows it can generate (Fisher and Heiken1982). The volcano has a long history of eruptions in the last 5,000 years (Westercamp and Traineau 1983). In more recent historic times the volcano erupted in 1635, 1792, in 1851-1852, in 1902- 1905 (Heilprin 1908) and in 1929-1932 (Perret 1937). The historic record documents two extremely violent eruptions in 1792 and in 1902 - associated with numerous other phenomena that followed dome collapses ­ and by which local tsunamis were generated. The eruptive processes of Mt. Pelée and the tsunami generation mechanisms that are described in subsequent sections are based on what occurred on Martinique in May of 1992 and whatever little is known about the violent volcanic eruption of 1792. Eruption Processes of Mt. Pelée - Eruptions of Mt. Pelée range in volcanic explosivity intensity from severe Vulcanian (VEI = 3) - which can occur yearly - to cataclysmic Vulcanian-Plinian events (VEI = 4) separated in time by many decades. The Peléeean eruptions - as they are now termed because of their unique characteristics - are extremely violent eruption events that often include collapses of ash columns, and unique pyroclastic flows known as "nuées ardentes" - a type of pyroclastic avalanche mixture of gas, dust, ash and other hot glowing incandescent solid particles and lava fragments - and debris avalanches containing large amounts of ignimbrites (ash flow tuffs). These unusual pyroclastic flows are usually triggered after a lava dome collapse. The Eruption and Tsunamis of May 1902 ­ A previously stated, an extremely violent volcanic eruption occurred on Mt. Pelée in 1792. It is very probable that a tsunami was generated at that time as a result of a flank failure or pyroclastic flow, but there are no reports documenting it. However, the 1902 eruption and its associated unusual phenomena are well documented in the literature (Lacroix, 1904; Heilprin 1908; Fisher et al 1980). 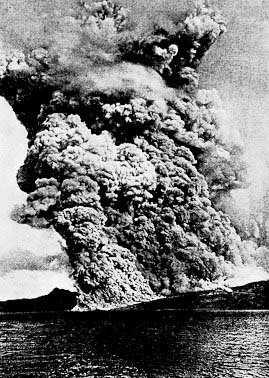 The May 1902 tsunamis were generated by a lahar and a subsequent nuée ardente of a violent eruptive phase. In early 1902, a large dome of very viscous lava had grown on Mt. Pelée's flank near its summit, largely by expansion from within. As the lava dome grew, its outer surface cooled and hardened. There is not much information on the size of this particular lava dome, but it could have been as big as that of the Katmai volcano in Alaska, which collapsed and triggered an eruption in 1912. That dome had been circular and measured about 250 meters across and 60 meters in height. However, what was reported about Mt. Pelée's lava dome is that it had cut a large V-shaped notch through the cliffs that surrounded the volcano's summit crater. According to reports, the "notch was like a colossal gun sight pointing directly at the town of St. Pierre". Fig. 13. The 1902 Eruption of Mt. Pelée on the island of Martinique. The destruction of the town of St. Pierre was caused by a nuée ardente. (Photograph by Heilprin, 1902). According to historic records, on May 5, 1902, a 35-meter lahar cascaded down the flank of the volcano and reached the sea. The lahar generated a local tsunami wave of about 4-5 meters in height, which killed one hundred people in St. Pierre. Subsequently, at approximately 7:50 a.m. on May 8, 1902, the pressure from within the volcano reached a critical level. Suddenly, the summit lava dome collapsed and shattered with a deafening roar, spilling loose fragments down-slope. The sudden release of pressure triggered by the dome collapse resulted in an extremely violent eruptive phase of Mt. Pelée. A large nuée ardente cascaded from the central crater for about 6 km down the south flank, at a velocity of more than 140 Km per hour. In less than one minute it struck the coastal town of St. Pierre, destroying it completely and killing 29,000 of its inhabitants. Only two people are known to have survived. According to reports (Heilprin 1908; Fisher et al 1980) the directional blast was so strong that it carried a three-ton statue sixteen meters from its mount. One-meter thick masonry walls were blown into rubble. "Supporting girders were mangled into twisted strands of metal". The heat of the nuée ardente nuee was immense and ignited huge fires. Thousands of barrels of rum that was stored in the city's warehouses exploded and burned in the streets. Fig. 14. 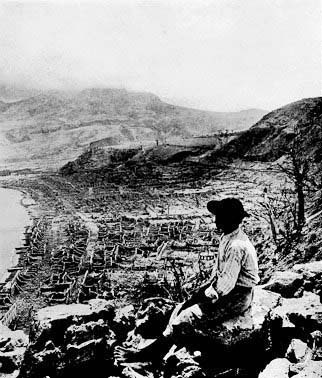 Devastation of the town of St. Pierre on Martinique Island by a Nuee Ardente of the 1902 eruption of Mt. Pelée. (Photograph by Heilprin, 1902). There is not much direct information on the tsunami that the nuée ardente must have generated, as the immensity of St. Pierre's destruction overshadowed everything else. However, it was reported that the nuée ardente continued seaward toward the harbor where it destroyed at least twenty ships that were anchored offshore. The American sailing ship "Roraima", which had arrived only a few hours earlier, burned and all its crew and passengers perished. The steamship "Grappler" was presumably capsized by the force of the nuée ardente. However, it is more than likely that it was capsized by the wave the nuée ardente generated in the harbor. Mechanisms of tsunami generation involving cascading volcanic gases and rapidly moving pyroclastic flows are not confined to Caribbean volcanoes or to Mt. Pelée, in particular. There is evidence that similar hot glowing avalanches of hot gas, dust, ash and pyroclastics have generated several tsunamis in the distant past in New Zealand and elsewhere around the world. La Soufrière is an active and dangerous stratovolcano on the island of St. Vincent in the Windward Islands of the Caribbean, with a well-documented history of violent eruptions (Robson, 1965a, Shepherd and Aspinall. 1982). The present elevation of its summit is at 1220m. There is a lake within the summit crater. La Soufrière should not be confused with a volcano by the same name on the island of Guadaloupe. There evidence of activity on Soufrière for the last 650,000 years (Hay 1959; Rowley1978). In recent times, major eruptions occurred in 1718, 1784,1812, 1814, 1880, 1902-03 (Anderson 1784; Anderson, T. 1903; Flett 1902,1908; Anderson and Flett 1903; Sapper 1903; Anderson 1908, Carey and Sigurdsson 1978). In the twentieth century they were major eruptions, in 1971-72 (Aspinall et al 1972; Baker, 1972; Tomblin et al. 1972; Aspinall 1973; Aspinall et al 1973) and in 1979 (Shepherd et al 1979; Shepherd et al 1982; Barr and Heffter 1982; Brazier et al 1982; Fiske and. Sigurdsson. 1982; Graham and Thirlwall. 1981). The 1812 eruption resulted in many deaths. However, the 1902 eruption was the most catastrophic of all resulting in the loss of 1,600 lives. Eruption Processes of Soufrière - Geologic evidence indicates that for the past 4,000 years the Soufrière volcano's eruptions have alternated between explosive episodes associated with the forceful ejection of fragmented material and pyroclastic flows to quiet effusion of slow moving lava that forms summit domes (Earle 1924; Hay 1959; Heath et al 1998). The 1979 eruption is typical of such variation. It begun quite suddenly with less than 24 hours of precursor activity. The mechanism of its subsequent explosive eruption has been well documented (Shepherd and Sigurdson 1982). The first eruptive episode was Vulcanian in character. It sent a plume of steam and tephra to a height of 20 km. and lasted a little less than two weeks (Sparks and Wilson. 1982). The second episode consisted of a quiet extrusion and growth of a basaltic andesite lava dome (Huppert et al. 1982). The Eruption and Tsunamis of May 7, 1902 - There is not much information about tsunamis generated from eruptions or flank failures of the Soufrière stratovolcano, although several must have occurred in the geologic past - and even more recently. 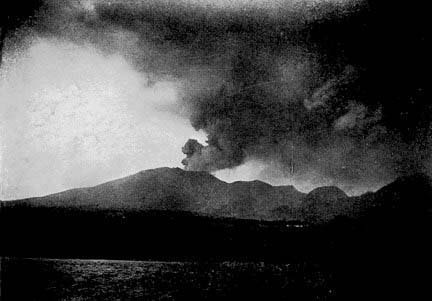 The record shows that on May 7, 1902, a day before the most violent eruption of Mt Pelée on Martinique, tsunamis like disturbances of up to 1 meter were reported for the harbors of Grenada, Barbados and Saint Lucia. Although the origin of these waves is not known, the most likely source could have been air pressure waves from the violent eruption of Soufrière on that day, or pyroclastic flows and debris avalanches reaching the sea. Coincidentally, the historic record also shows that on the same day - May 7, 1902 - the submarine communication cables from the island of Martinique to the outside world were cut. Whether these cables routed near St. Vincent Island is not known. The exact area where the cables failed is not known. Thus, it is difficult to determine what caused the cable failures and whether the sea level disturbances observed at the harbors of Grenada, Barbados and Saint Lucia had the same source. The waves could have been generated by an unknown flank failure of Mt Pelée, and the cable failures by an underwater debris avalanche. On May 5, Martinique had already experienced a destructive local tsunami generated by a lahar. Kick'em Jenny is a growing submarine volcano about 8 km off the north side of the island of Grenada. It is the southernmost active volcano in the Lesser Antilles volcanic arc and has erupted frequently during the 20th Century (Smithsonian Institution, 1999). Presently, the volcano has a circular base of about 5000m, its main cone has reached a height of about 1300m above the sea floor, and its summit is only 160 m below the sea surface. The volcano is growing rapidly at a rate of approximately 4 meters per year. At this rate the volcano is expected to reach the surface and form an island in the near future ­ if there is no flank subsidence or cone collapse. Kick'em Jenny's first recorded eruption occurred in 1939, but many unreported eruptions must have occurred prior to that date. Since 1939 there have been at least twelve or more events. Most of the historical eruptions were documented by acoustic measurements, since submarine volcanoes generate strong acoustic signals that are recorded by seismographs. Known eruptions occurred in 1939,1943, 1953, 1965, 1966, 1972, 1977, 1988, and in1990. The better-known events are those that occurred in 1943, 1953, 1965, 1966, 1972 and 1974. The last major eruption occurred in 1990. Earthquake swarms in late 2001 indicated renewed activity. The latest eruption occurred on March 15, 2003. In 2003, during a survey of Kick 'em Jenny, an inactive underwater volcano was discovered about 3 km away. It is, now known by the name of Kick'em Jack. Its summit elevation is 190 m below the sea surface. The Eruption and Tsunamis of 1939 and 1974: According to historical accounts and eyewitness reports from northern Grenada, the July 24, 1939 eruption of Kick'em Jenny was major and lasted for at least 24 hours. The eruption ejected a cloud plume above the sea surface. Furthermore at the peak of the eruption, the cloud plume rose 275 meters above the sea surface (Tilling, 1985; Univ. of West Indies, 2001). The eruption generated numerous tsunami-like waves of short period. These waves had maximum amplitudes of about 2 meters in northern Grenada and the southern Grenadines, but were almost imperceptible when they reached the west coast of the Barbados. Eruption Processes of Kick'em-Jenny: The underwater topography of the sea floor north of Grenada indicates that Kick'em Jenny comprises of three small craters and two lava domes ­ all of which probably share the same magmatic chambers. As most of the Caribbean volcanoes, Kick'em Jenny has had both violent and effusive eruptive episodes. Eruptions of the volcano have been associated with magmas, which have ranged in compositions from basalt to basaltic andesitic. Thus, gently extruded submarine pillow lavas and domes as well as tephra and other pyroclastics from minor phreatomagmatic explosions, are present in submarine deposits around the volcano. Flank instability: The distribution and orientation of pyroclastic deposits on the sea floor, primarily to the west side of Kick'em Jenny, indicate that many volcanic eruptions must have occurred that have been lateral or channelized blasts, possibly following the collapse of lava domes. Furthermore NOAA surveys in 2003 demonstrated the presence of deposits from a debris avalanche. The geomorphology of the sea floor indicates that this debris avalanche extends west for 15 km and perhaps as much as 30 km from the volcano, into the Grenada Basin (Sigurdsson et al 2004). 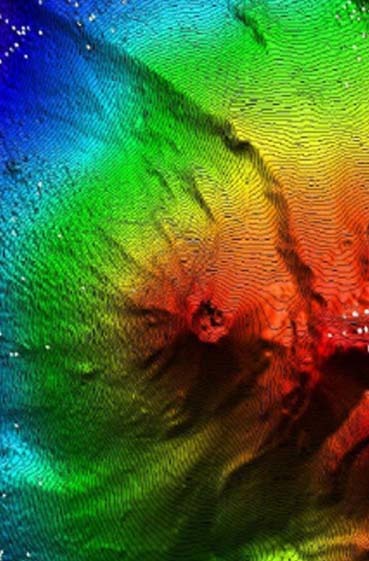 Also, earlier multibeam surveys of the sea floor discovered the existence of an arcuate fault escarpment - of yet unknown age - to the east of the active cone. Because of its shape and length, this escarpment cannot be related to caldera subsidence and collapse. Its configuration and the overall geomorphology of the sea floor suggest that a larger scale subsidence or volcanic mass edifice collapse occurred in the distant past. 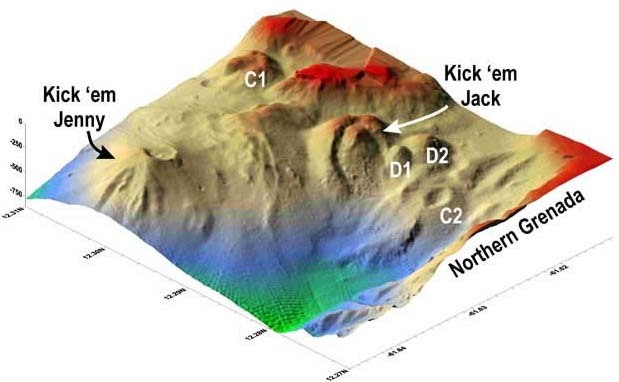 It also suggests that Kick'em Jenny volcano might have been at or above sea level in the past. instability and might also slow down the rate of growth. Future major eruptions can be expected to be more violent and to eject sizeable columns above the sea surface to heights much greater than those of the 1939 and 1974 events. Major future eruptions can be expected to have considerably higher plume clouds, because of the greater strength of hydromagmatic episodes as the summit approaches the sea surface and the inclusion of a higher content of molecular water ­ in the form of superheated steam - along with ejected tephra and other fine pyroclastic materials. The frequency of Kick'em Jenny's eruptions and the volcano's rapid growth toward the sea surface have raised concerns that future eruptions will generate tsunami waves with far reaching destructive effects on Caribbean islands and along the coast of Venezuela. Earthquake swarms in late 2001 added to concerns that Kick'em Jenny will again have a major eruption. Although there is a good probability that several eruptions will occur in the near future ­ and in fact the latest occurred on March 15, 2003 - the potential tsunami risk from a future eruption has been highly exaggerated by the introduction of speculative and highly unrealistic "worst case" scenarios. Kick'em Jenny is not Krakatau and does not pose the purported potential tsunami danger that has been misreported by the media. Kick'em Jenny is a much smaller volcano than Krakatau and has much smaller crater dimensions and magmatic chambers. The tectonic interactions that have produced this volcanic center in the Caribbean are substantially different than those of Krakatau, which erupted in 1883 and generated a destructive tsunami, which killed nearly 37,000 people in Indonesia (Pararas-Carayannis, 2003). Kick'em Jenny's magmatic geochemistry is substantially different. Its magma composition ranges from mainly basalt to basaltic andesite. At the present stage of its development, Kick'em Jenny volcano's small dimensions and geochemistry prevent eruptions of Vulcanian or Plinian intensity or extremely massive volcanic edifice collapses. The following is a realistic analysis of Kick'em Jenny's tsunamigenic potential and future risks. Tsunami Generation from Submarine Explosive Eruptions: Even a major explosion at a peak phase of Kick'em Jenny's eruption would be expected to generate tsunami-like waves, not as a single event but spread over a period of 24 hours or more. The periods of these waves will be relatively short and will range from 1-4 minutes at the most. Because of the short periods and wavelengths, the wave heights will decay rapidly with distance. As in 1939, the waves from future eruptions will be of significance along the north coast of Grenada and along the western coasts of Isla de Ronde and Isla Calle (Grenadine Islands), and possibly Tobago, St. Vincent and Barbados, but not anywhere else in the Caribbean. This conclusion is further supported by the numerical modeling studies that were conducted at the Los Alamos National Laboratory (Gisler et al 2004). Specifically, numerical simulations of Kick-'em Jenny's explosions with the same 3-D compressible hydro code used for asteroid impacts - and injecting as much as 20 kilotons of thermal energy at the apex of Kick'em Jenny's volcanic cone, confirmed that only short period tsunami-like waves can be generated and that the waves will attenuate rapidly away from the source. Accordingly, it is concluded that explosive eruptions do not couple well to water waves. The waves that are generated from such eruptions are turbulent and highly dissipative, and don't propagate well. 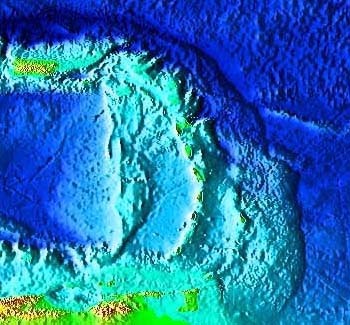 Tsunami Generation from Submarine Crater Collapses: Even if one or all of Kick'em Jenny's three small craters collapse, no major waves will be generated. For example, when the summit of the submarine volcano Loihi collapsed in Hawaii during the summer of 1996, the wave that was generated was of short period and decayed very rapidly (Mader 2004). The cavity generated by the Loihi collapse was 1000 meters wide and 300 meters deep, which is much greater than any potential cavity that could be expected from collapses of any or all of Kick'em Jenny's craters. The fact that the top of the Loihi cavity was at 1050 meters depth while the top of Kick'em- Jenny's main crater is at 160 meters will not be much of a factor in tsunami wave generation, since the waves will be of short periods and will behave as shallow waves. Tsunami Generation from Submarine Volcanic Dome Collapses: Similarly, submarine dome collapses on Kick'em- Jenny will probably trigger major eruptions ­ perhaps lateral blasts - with the associated pyroclastic flows and debris avalanches. However, it is expected that the volume of the ejecta and gases will be relatively small and that any resulting tsunami-like waves that will be generated will not be greater than those generated by the 1939 or 1974 eruptions. Tsunami Generation from Future Subaerial Volcanic c Collapses, Flank Failures and Massive Volcanic Edifice Failures: When Kick'em Jenny breaks through the sea surface and begins to build in height, it is expected that its eruptions will be more violent and that its flanks will be even more unstable than they are now. As with other active Caribbean volcanoes, waves may be generated by violent eruptive episodes, from caldera and dome collapses, from pyroclastic flows, landslides, flank failures, debris avalanches or even massive volcanic edifice failures. However the tsunami waves will be of relatively short periods (1-4 minutes at the most). Although the waves may be significant locally, they will decay rapidly away from the source area. Worse Possible Scenario: Based on the pattern of Kick'em Jenny's eruptive activity, a "worst case scenario" at the present time would be a repeat of the 1939 eruption but at the shallower depth of the present summit. The waves from the 1939 event were about 2 meters in northern Grenada and the southern Grenadines but substantially lower on the west coast of the Barbados. A large violent eruption similar to the 1939 event, at the present depth of summit, can be expected to generate waves with a probable maximum runup of about 3 meters in Northern Crenada and the Grenadines, and as much as 1-2 meters along the west coast of the Barbados, Trinidad, and St. Vincent. The wave heights along the nearest coastline of northern Bonaire and Venezuela may be up to 1 meter at the most. When the volcano breaks through the surface of the sea, the probable maximum runup could be as much as 4 meters on Northern Grenada and as much as 2 meters along the west coast of the Barbados, Trinidad, and St. Vincent. The historic record indicates that Caribbean volcanoes pose a serious threat for several islands in the region (Robertson1992, 1995). The1902 eruptions of Mt Pelée on Martinique and of La Soufrière on St Vincent, and the more recent eruptions of Soufriere Hills on Montserrat, and of Kick'em Jenny in Grenada increased awareness that tsunamis generated from volcanic sources represent an additional hazard that needs to be addressed individually for each of the region's active volcanoes. Fortunately - and in contrast to the unpredictability of tsunamis of seismic origin - tsunamis generated form volcanic sources can be forecasted for the Caribbean region and appropriate measures can be taken. Preparedness for the tsunami hazard should include the monitoring of precursory eruptive processes as ongoing presently (Sigurdsson 1981; Shepherd and Aspinall 1982; Shepherd 1989) but, additionally, studies of geomorphologies and flank instabilities of each individual volcano and the mapping of risk areas that can contribute to massive volcanic edifice failures ­ with or without a volcanic triggering event ­ and thus in the generation of destructive tsunami waves. Already, as a result of greater awareness and concerns about the threat of volcanic hazards in the Caribbean region, several scientific organizations have already established monitoring stations on several islands. For example, following the devastating 1902 eruption of La Soufrière volcano on St. Vincent Island, a surveillance program was initiated. In 1952, a Seismic Research Unit was established on the island and a sustained program of volcano monitoring was undertaken (Fiske and Shepherd. 1990). Similarly, following the 1995 eruption of the Soufriere Hills volcano on the island of Montserrat, a monitoring program was established. Additionally, the Universities of Puerto Rico and of the West Indies have undertaken extensive monitoring functions and programs. Present volcano monitoring operations include routine measurements of geological, geophysical and geochemical parameters and assessments of precursory-to-an-eruption phenomena. With some small additional effort, these existing volcano monitoring programs in the Caribbean region can easily assess future risks for the collateral tsunami hazard, develop micro-zonation maps of potential tsunami hazard sites along the coast and help establish programs of tsunami preparedness for the public. The following sections summarize briefly the importance of monitoring some of the precursory-to-an-eruption phenomena as they relate to potential tsunami generation. Micro-earthquake Activity: Routine monitoring of a volcano's micro-earthquake activity helps forecast eruptions (Hirn et al1987). For example, before a major eruption occurs on Soufriere Hills on the island of Montserrat, the increasing pressure within the volcano generates a flurry of micro-earthquakes, which are indicative of magma movement. When this activity peaks and the focus of micro earthquakes becomes shallower, it becomes evident that the pressure within the volcano has reached a critical phase and that a fairly imminent eruption can be expected. Such monitoring is presently in effect for several islands with active volcanoes. Monitoring Lava Dome Formation and Rate of Growth: Measuring the swelling of the volcano with tilt meters and other geodetic and photogrammetric means may also indicate if there is intrusion by a lava dome, the dome's rate of growth, and its potential for collapse. Mature lava domes, which grow slowly, are usually non-explosive. Similarly non-explosive are post eruption lava domes, such as the felsic lava dome known as the Tower of Pelée - extruded in the waning stages of the 1902 eruption of Mt. Pelée on Martinique. However, younger, fast growing, pre-eruption extruded domes that contain lava which has not been completely degassed, may explode or collapse. The eruption and explosion of Mt. St. Helens in the State of Washington were preceded by the rapid development of a lava dome over a three-year period from 1980 to 1983. Also, a lava dome formed rapidly on the Soufriere Hills volcano's crater on Montserrat Island over a two-month period prior to the major eruption of 26 December 1997. The dome formation served as a natural warning for the residents of Plymouth to evacuate, thus there was no losses of life. Stations on several Caribbean islands with active volcanoes, routinely monitor lava dome formation and rates of growth. Evaluation of Potential Lava Dome Collapses: The periodic explosion or gravitational collapses of the viscous masses of lava domes can sometimes generate deadly pyroclastic flows that can reach the sea and generate tsunami waves. Lava dome collapses were associated with the 1902 eruption and nuée ardente of Mt. Pelée on Martinique, the 1902 eruption of Soufriere on St. Vincent Island and the 1997, 1999 and 2003 eruptions, pyroclastic flows and debris avalanches of Soufriere Hills on Monteserrat Island ­ the latter generating significant tsunami waves along the southwestern coast of the island. In view of the above, it is important to monitor changes of lava domes and their potential for collapses. Furthermore, since lava dome collapses, particularly near a volcanic summit may be followed by violent eruptions, pyroclastic flows and debris avalanches, the expected path of destruction and potential flank failure sites can be determined by careful evaluation of the local topography and geomorphology. Based on such assessments, coastal areas subject to the tsunami hazard could be identified, microzonation maps can be drawn and appropriate warning signs be posted for the protection of the public. Historical tsunami events from volcanic sources in the Caribbean Region have been under-reported as the immensity of destruction from volcanic events has overshadowed them. Small scale flank failures are quite common for most of the active volcanoes in the Caribbean. Such volcanic sources have the potential of generating destructive local waves in confined bodies of water and in the near field environment of an open coast. Local tsunamis can also be generated by gravity-induced flank failures, even in the absence of eruptive triggering events. Heavy rains and earth tides appear to play a significant role in small scale flank failures of unstable volcanic slopes. Tsunami or tsunami-like waves can be generated by a variety of volcanic mechanisms, pyroclastic flows, debris avalanches, and volcanic edifice mass failures and by aerial or submarine landslides. Impulsively generated waves from such complex source mechanisms behave non-linearly and change significantly away from the source, with varying near and far field effects and terminal run up heights. However the wave periods are short and range from 1-4 minutes at most. The heights of these waves attenuate rapidly with distance because of relatively smaller source dimensions and shorter wave periods and do not pose a significant danger at great distances from the source. Caribbean volcanoes and their associated flank failures can be forecasted with careful monitoring and programs of preparedness need to be established. At the present time. the Soufriere Hills volcano on the island of Montserrat poses the greater threat of local tsunami generation in the Eastern Caribbean Region. Its eruptive activity in the last decade, the rapid rates of lava dome formations and growth and the associated collapses and eruptive style, indicate ongoing active volcanic processes that will continue for many years. Tsunamis can be expected in the near future from both pyroclastic flows reaching the sea and by flank collapses. The historic record supports that Mt. Pelée on the island of Martinique will continue to pose a threat for a repeat of a Vulcanian-Plinian episode in the future. When this will happen is not known. However, given the sophistication of present monitoring programs, any future activity of the volcano will be properly forecasted and cautionary measures will be taken. Local tsunamis may be expected around the island by flank failures of unstable slopes, even in the absence of a triggering volcanic event. Also, The historic record supports that the stratovolcano "La Soufrière" on the island of St. Vincent poses a very significant threat for renewed activity in the future. Given the fact that there is a lake at the summit, there is also a potential danger that even an eruption of moderate activity may cause a breach on the crater's rim and trigger a dangerous lahar which may be destructive and may even generate a local tsunami if it reaches the sea. Also the instability of La Soufrière flanks pose a threat of failures and of local tsunami generation ­ even in the absence of a volcanic eruption. Heavy rains, gravitational forces and earth tides may be significant triggering factors. Kick them Jenny volcano will continue to rise towards the surface and eventually will form an island volcano. It is possible that its present rate of growth may be slowed down by cone collapses and subsidence. The dimensions of the volcano and the style of expected eruptions and intensities limit the size of tsunamis that can be generated from future events. A large violent eruption of the Kick'em Jenny volcano at the present depth of the summit, can be expected to generate waves with a probable maximum runup of about 3 meters in Northern Crenada and the Grenadines, and as much as 1-2 meters along the west coast of the Barbados, Trinidad, and St. Vincent. The wave heights along the nearest coastline of northern Bonaire and Venezuela may be up to 1 meter at the most. When the volcano breaks through the surface of the sea, the probable maximum runup of a tsunami from a major eruption could be as much as 4 meters on Northern Grenada and as much as 2 meters along the west coast of the Barbados, Trinidad, and St. Vincent. AAPG International Meeting,, 2003.Caribbean Plate Origin. Caribbean Tectonics, Barcelona, Spain, September 21-24. Anderson, J., 1784. An account of Morne Garou, a mountain in the island of St. Vincent with a description of the volcano on its summit, Philosophical Transactions of the Royal Society 125:32. Anderson, T., 1903. Recent volcanic eruptions in the West Indies. The Geographical Journal. Anderson, T., 1908. Report on the eruptions of the Soufrière in St. Vincent in 1902, and on a visit to Montagne Pelèe in Martinique - The changes in the district and the subsequent history of the volcanoes. Philosophical Transactions of the Royal Society Series A, 208 (Part II):275-352. Anderson, T., and Flett S. J.,1903. Report on the eruption of the Soufrière of St. Vincent in 1902 and on a visit to Montagne Pelèe in Martinique. Part I. Royal Society Philosophical Transactions Series A-200:353-553. Aspinall, W.P., 1973. Eruption of the Soufrière volcano on St. Vincent island, 1971-1972. Science 181:117-124. Aspinall, W.P., H. Sigurdsson, and Shepherd. J.B.,1973. Eruption of the Soufriere volcano on St. Vincent island, 1971-19721. Science 181:117-124. Aspinall, W.P., Sigurdsson, H., Shepherd, J.B., Almorales, H. and P.E. Baker. 1972. Eruption of the Soufrière Volcano on St. Vincent island, 1971-72. In Smithsonian Institute for Short-Lived Phenomena. Baker, P.E., 1972. 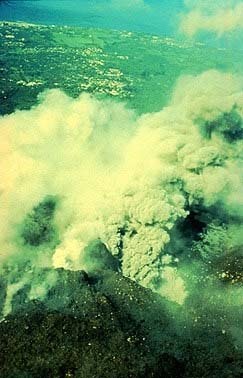 The Soufrière volcano, St. Vincent and its 1971-72 eruption. Journal of Earth Sciences, Leeds 8 (Pt. 2):205-217. Beer, T., 1974. Atmospheric Waves. Wiley, New York, 300 pp. Brazier, S. A., Davis, N., Sigurdsson, H. , and R. S. J. Sparks. 1982. Fallout and deposition of volcanic ash during the 1979 explosive eruption of the Soufrière of St. Vincent. Journal of Volcanology and Geothermal Research 14 (3-4):335-359. Brown, G.M., Holland, J.G., Sigurdsson, H., Tomblin, J. F. and R.J. Arculus. 1977. Geochemistry of the Lesser Antilles volcanic island arc. Geochimica et Cosmochimica Acta 41:785-801. Carey, S.N., and Sigurdsson H.. 1978. Deep-sea evidence for distribution of tephra from the mixed magma eruption of the Soufrière on St. Vincent, 1902: Ash turbidites and air fall. Geology 6:271-274. DeGraff, J.V., 1988. Landslide hazards on St. Vincent and the Grenadines, West Indies. Washington, D.C.: Dept. Reg. Div., Organisation of American States. Deplus, C., Le Friant, A., Boudon, G., Komorowski J. -C., Villemant, B., Harford, C., Segoufin, J., and Cheminee, J. -L., 2001. Submarine evidence for large-scale debris avalanches in the Lesser Antilles Arc, Earth and Planetary Science Letters, 192, 2, 145­157. Devill, S-C. 1867. Sur le tremblement de terre du 18 Novembre 1867 aux Antilles, Comptes Rendus Acad. Sci. Paris, 65, 1110­1114. ETDB/ATL 2002. Expert Tsunami Database for the Atlantics, Version 3.6 of March 15, 2002. Tsunami Laboratory, Novosibirsk, Russia. Fisher, R.V., and Heiken, G., 1982. Mt. Pelee, Martinique; May 8 and 20, 1902, pyroclastic flows and surges: Journal of Volcanology and Geothermal Research, v. 13, p. 339-371. Fisher, R.V., Smith, A.L., and Roobol, M.J., 1980. Destruction of St. Pierre, Martinique by ash-cloud surges, May 8 and 20, 1902: Geology, v. 8, p. 472-476. Fiske, R.S., and Sigurdsson, H., 1982. Soufriere volcano, St. Vincent: Observations of its 1979 eruption from the ground, aircraft, and satellites: Science, v. 216, p. 1105-1126. Fiske, R. S., and J. B. Shepherd. 1990.12 Years of Ground-Tilt Measurements On the Soufrière of St- Vincent, 1977-1989. Bulletin of Volcanology 52 (3):227-241. Hay, R.L. 1959. Formation of the crystal-rich glowing avalanche deposits of St. Vincent, B.W.I. Journal of Geology 67:540-562. Heath, E., R. MacDonald, H. Belkin, C. Hawkesworth, and H. Sigurdsson. 1998..Magmagenesis at Soufrière Volcano, St Vincent, Lesser Antilles arc. Journal of Petrology 39 (10):1721-1764. Heilprin, A., 1908. The eruption of Pelee: Philadelphia Geographic Society, 72 p.
Heinrich, F., Boudon, G., Komorowski, J. C., Sparks, R. S. J., Herd, R., and Voight, B. 2001. Numerical simulation of the December 1997 debris avalanche in Montserrat. Geophys. Res. Lett., 28, 13, 2529­2532. Hirn, A., Girardin, N., Viode, J.-P., and Eschenbrenner, S., 1987. Shallow seismicity at Montagne Pelee volcano, Martinique, Lesser Antilles: Bulletin of Volcanology, v. 49, p. 723-728. Hooper, D. M. and Mattioli, G. S. 2001. Kinematic modelling of pyroclastic flows produced by gravitational dome collapse at Soufriere Hills. Natural Hazards, 23, 65­86. Imbo, G., 1965. 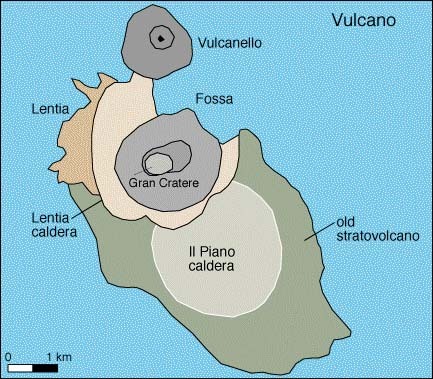 Catalogue of the active volcanoes of the world including solfatara fields, Part XVIII, Italy: International Association of Volcanology. Keller, J., 1980 .The island of Vulcano: Soc. Italiana Min. Petr., 36, p. 368-413. Lacroix, A., 1904. La Montagne Pelee et ses eruptions: Paris, Masson et Cie, 622 p.
Lander, J. F., Whiteside, L. S., and Lockridge, P. A 2002. A brief history of tsunami in the Caribbean Sea, Science of Tsunami Hazards, 20, 2, 57­94. Lander James F., Whiteside Lowell S., Lockridge P A 2003. TWO DECADES OF GLOBAL TSUNAMIS 1982-2002. Science of Tsunami Hazards, Volume 21, Number 1, page 3. Le Friant, A. 2001. Les destabilisations de flanc des volcans actifs de l'arc des Petites Antilles: origines et consequences, These de Doctorat, Universite de Paris VII, 377p. Mader, C .L. 2004. The Loihi Cone Collapse. In Numerical Modeling of Water Waves - Second Edition, CRC Press, pages 130-132. Mangeney A., Heinrich F., Roche, R., Boudon, G., and J. L. CheminÎe. 2000. Modeling of debris avalanche and generated water waves. Application to real and potential events in Montserrat. Phys, Chem. Earth 25(9-11), 741-745. Mercado, A. and McCann, W. 1998. Numerical simulation of the 1918, Puerto Rico tsunami, Natural Hazards, 18, 1, 57­76. Mikumo, T. and Bolt, B.A. 1985. Excitation mechanism of atmospheric pressure waves from the 1980 Mount St. Helens eruption. Geophysical Journal of the Royal Astronomical Society, 81(2), 445-461. Newhall, C.G. and Self, S. 1982. The volcanic explosivity index (VEI): An estimate of explosive magnitude for historical volcanism. Journal of Geophysical Research, 87(C2), 1231-1238. Pararas-Carayannis, G. 1992. The Tsunami Generated from the Eruption of the Volcano of Santorin in the Bronze Age. Natural Hazards 5:115-123. Pararas-Carayannis, G. 2002. Evaluation of the threat of mega tsunami generation from postulated massive slope failures of island stratovolcanoes on La Palma, Canary Islands, and on the Island of Hawaii, Science of Tsunami Hazards, Vol. 20, 5, 251­277. Pararas-Carayannis, G. 2003. Near and Far-Field Effects of Tsunamis Generated by the Paroxysmal Eruptions, Explosions, Caldera Collapses and Slope Failures of the Krakatau Volcano in Indonesia, on August 26-27, 1883, Journal of Tsunami Hazards, Vol. 21, Number 4. Pelinovsky E., Zahibo N., Dunkley P., Edmonds M., Herd R., Talipova T. , Kozelkov A., and I. Nikolkina, 2004. Tsunami Generated by the Volcano Eruption on July 12-13, 2003 at Montserrat, Lesser Antilles. Sciences of Tsunami Hazard Vol. 22, No. 2, pages 44-57. Perret, F.A., 1937. The eruption of Mt. Pelee, 1929-1932: Carnegie Institute of Washington Publication, v. 458, 126 p.
Reid, H. F. and Taber, S. 1920. The Virgin Islands Earthquakes of 1867­ 1868, Bull. Seismol. Soc. America, 10, 9­30. Rowley, K.C. 1978. Stratigraphy and geochemistry of the Soufriere Volcano, St. Vincent, West Indies. PhD, Seismic Research Unit, University of the West Indies, St. Augustine. Scheffers A. and Kelletat D. 2004. New Evidence and Datings of Paleo-Tsunami Events in the Caribbean, Essen University (Germany). NSF Caribbean Tsunami Workshop. Puerto Rico March 30-31. Univ. of West Indies 2001. Seismic Research Unit Website. Seno T. and Yamanaka Y.1998. Arc stresses determined by slabs: Implications for back-arc spreading, Earthquake Research Institute, University of Tokyo, Geopys. Res. Lett., 3227-3230. Shepherd, J.B., Aspinall, W.P., Rowley, K.C., and others, 1979, The eruption of Soufriere volcano, St. Vincent, April-June, 1979: Nature, v. 282, p. 24-28. Shepherd, J.B., and Sigurdsson, H., 1982. Mechanism of the 1979 explosive eruption of Soufriere volcano, St. Vincent: Journal of Volcanology and Geothermal Research, v. 13, p. 119-130. Smith, A.L., and Roobol, M.J., 1990. Mt. Pelee, Martinique; A study of an active island-arc volcano: Boulder, Colorado, Geological Society of America Memoir 175, 105 p.
Smithsonian Institution 1999. - Global Volcanism Program Kick-'em-Jenny Website, August. Tahira, M., Nomura, M., Sawada, Y., and Kamo, K. 1996. Infrasonic and acoustic-gravity waves generated by the Mount Pinatubo eruption of June 15, 1991. Fire and Mud. University of Washington Press, Seattle, 601- 614. 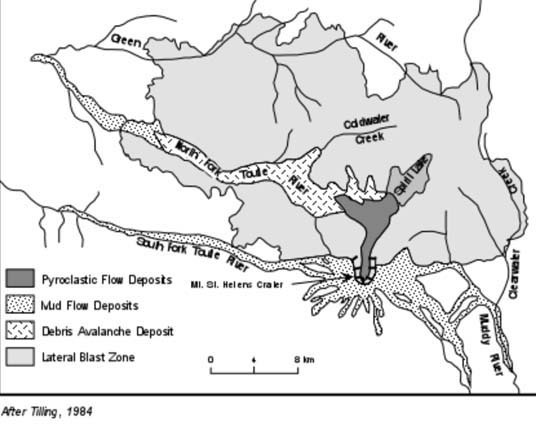 Tilling, Topinks, and Swanson, 1990, Eruptions of Mount St. Helens: Past, Present, and Future: USGS General Interest Publication. Voight B. 2000. Structural stability of andesite volcanoes and lava domes Philosophical Transactions: Mathematical, Physical and Engineering Sciences Vol 358, No 1770, Pages: 1663 - 1703 / May 15. Weissert, T. P.1990. Tsunami travel time charts for the Caribbean, Science of Tsunami Hazards, 8, 2, 67­78. Westercamp, D., and Traineau, H., 1983. The past 5,000 years of volcanic activity at M. Pelee, Martinique (F.W.I. ); Implications for assessment of volcanic hazards: Journal of Volcanology and Geothermal Research, v. 17, p.159-185. Wright, T.L., and Helz, R.T., 1987. Recent advances in Hawaiian petrology and geochemistry, in Decker, R.W., Wright, T.L., and Stauffer, P.H., eds., Volcanism in Hawaii: U.S. Geological Survey Professional Paper 1350, v. 1, p. 625-640. Young R. S., 2004. Small scale edifice collapse and tsunami generation at eastern Caribbean volcanoes; a standard phase of the volcanic cycle. NSF Caribbean Tsunami Workshop, Puerto Rico March 30-31. Zahibo, N. and Pelinovsky, E. 2001. Evaluation of tsunami risk in the Lesser Antilles, Natural Hazard and Earth Sciences, 3, 221­231.